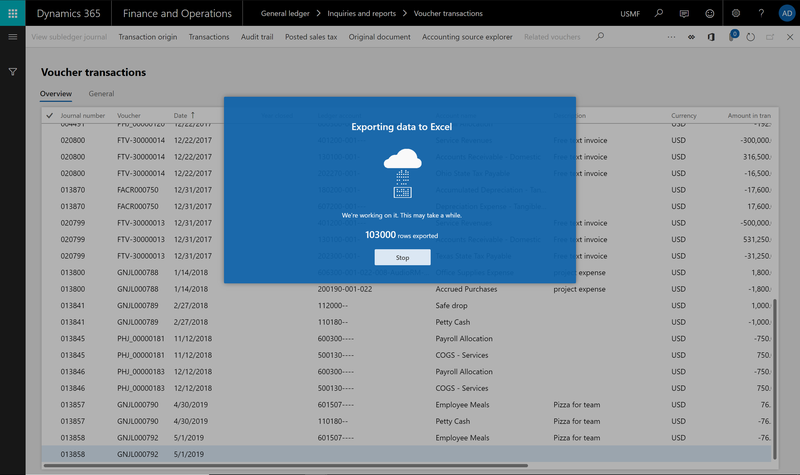 Because Finance and Operations can now allow much larger datasets to be exported to Excel, two adjustments have been made to the user's experience with the Export to Excel feature. A new dialog is shown during the export that provides the user with feedback and progress. The dialog also allows the user to stop the export at any point and get a file containing the data exported so far. The speed of the export will vary by dataset and will be dependent on the number of rows exported, the number of columns in the grid, the presence of display methods (calculated columns), and the presence of dimension fields in the grid. This feature is available in Platform update 22. After the export completes, users receive a notification in the Action center alerting them that the export has finished. The notification includes a link to download the Excel file containing the exported data. The link and notification are accessible for roughly three days after the export completes. This feature is available in Platform update 23. For more information, see Troubleshoot the Office integration.